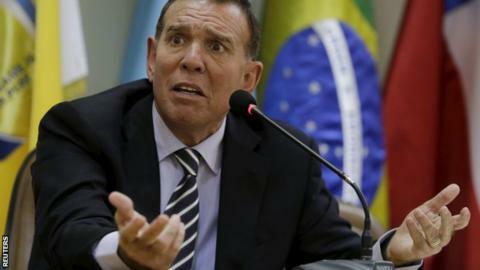 Fifa vice-president Juan Angel Napout has resigned as president of Conmebol, South America's football confederation. Napout, 57, was arrested in Zurich at the request of US authorities last week and is currently banned from football. The US Department of Justice alleges the 16 were involved in "racketeering, wire fraud and money laundering conspiracies" that saw them solicit and receive "over $200m (£132m) in bribes and kickbacks". The total number of individuals and entities - such as sports marketing companies - charged to date is now 41. Of those, 12 individuals and two sports marketing companies have already been convicted as a result of the ongoing investigation. Napout was elected as Paraguayan Football Association president in August 2007 and served until 2014, when he took over the Conmebol presidency on an interim basis. He was elected to the Conmebol presidency on a permanent basis in March and was expected to serve until 2019. "With the resignation of Mr Juan Angel Napout as president, the congress was convened for the election of officers [president and vice-presidents] for 26 January 2016," a Conmebol statement read. Brayan Jimenez - Guatemala FA chief and member of the Fifa committee for fair play and social responsibility.